Three hand carved flower, tribal design black 11mm Tahitian pearls. Solid 14k gold 3mm round link chain and spring clasp. Pearl shape：round. Pearl Color: Black. Pearl size：8-9mm. Necklaces (bracelet) are strung by hand and double knotted. Only one (Note: if the item has sold, we will change the picture of the item.). buy to take action in advance. Style: ChainLength: 7.5 - 7.99"
Material: pearl. It's just take you 1 minute. COLOR: black. We will reply within 24 hours. 100% physical picture. Beautiful and elegant 100% authentic fine quality baroque shaped Tahitian black pearl chain bracelet in solid 14K yellow gold. 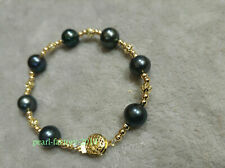 Pearls: a total of 5 fine quality 100% authentic baroque shaped Tahitian black pearls. Beautiful and elegant 100% authentic fine quality baroque shaped Tahitian black pearl chain bracelet in 14K solid yellow gold. 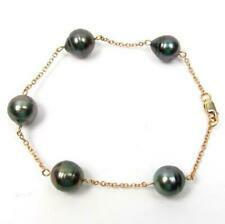 Pearls: a total of 5 fine quality 100% authentic baroque shaped Tahitian black pearls. Pearl color:black. Pearl size:11-10mm. 100% natural, real pearls. From ChinaMetal: Yellow GoldStyle: ChainLength: 7.5 - 7.99"
Ending 1 May at 11:05 SGT4d 16hTop-rated sellerFrom ChinaMetal: Yellow GoldStyle: ChainLength: 7.5 - 7.99"
Markings : Nanis, 750 italy. Main Stones: 3 matching oval shaped Black Mother of Pearl Links. Jewelry Type :Bracelet. 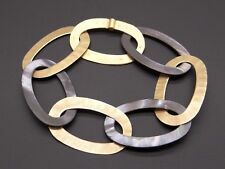 Accents : 4 matching 18kt gold links. The necklace and bracelet. are hand knotted between each pearl use double silk thread. Metal: Yellow GoldStyle: ChainLength: 7.5 - 7.99"
BRACELET 7.5-8"14K GOLD CLASP. The necklace is strung on double silk threads, knotted between each pearl for security and durability, finished with a very elegant. pearl size:10-9mm. Q: Can l get my necklace or bracelet in a longer or shorter length?. Pearl shape： Baroque. Pearl size：12-13mm. Pearl Color:black/blue. hope for your understanding! I am trying my best to provide high quality and beautiful jewelry to you. within 24 hours. BRACELET 7.5-8"14K GOLD CLASP. The necklace is strung on double silk threads, knotted between each pearl for security and durability, finished with a very elegant. pearl size:10-11mm. Q: Can l get my necklace or bracelet in a longer or shorter length?. BRACELET 7.5-8"14K GOLD CLASP. The necklace is strung on double silk threads, knotted between each pearl for security and durability, finished with a very elegant. pearl size:11-12 mm. Q: Can l get my necklace or bracelet in a longer or shorter length?. Pearl color: Black. Pearl size:10-11mm. We will respond within 24-48 hours, in most cases sooner. Pearl Color:Black. Pearl size：10-11mm. Necklaces (bracelet) are strung by hand and double knotted. Pearls are hand picked and assorted. hope for your understanding! I am trying my best to provide high quality and beautiful jewelry to you. Pearl shape：Round. Pearl color: Black(as picture ). Pearl size ：8-9mm. Necklaces (bracelet) are strung by hand and double knotted. Bracelet length：7.5-8”. Only one (Note: if the item has sold, we will change the picture of the item.). Bangle Bracelet. pearl size: 10-11 mm. Pearl Bracelet. pearls shape : round. Jade Bracelet. Bracelet Ring Sets. Mala Bracelet. Agate Bracelet. Pearl shape：Round. Pearl color: Black (as picture ). Pearl size ：8-9mm. Necklaces (bracelet) are strung by hand and double knotted. Only one (Note: if the item has sold, we will change the picture of the item.). Unisex ring. The necklace and bracelet. are hand knotted between each pearl use double silk thread. I am scared to see low DSR rate or Neutral. #2, Neutral. jewelry box. health&beauty. hand piece. Pearl size：3 row 9-10mm. Pearl Color: Black. Pearl shape： Baroque. hope for your understanding! I am trying my best to provide high quality and beautiful jewelry to you. Pearl Color:Black/blue. Pearl size：12-13mm. Pearl shape：Baroque. Necklaces (bracelet) are strung by hand and double knotted. hope for your understanding! We have more than 20 years of rich experience in raising pearls and pearl jewel design. color;BLACK. Good luck! Cooperation happy! The necklace is strung on double silk threads, knotted between each pearl for security and durability, finished with a very elegant. pearl size: 8-9 mm. Q: Can l get my necklace or bracelet in a longer or shorter length?. The necklace and bracelet. are hand knotted between each pearl use double silk thread. #2, Neutral. I am scared to see low DSR rate or Neutral. Product View. Bangle Bracelet. The necklace and bracelet. are hand knotted between each pearl use double silk thread. 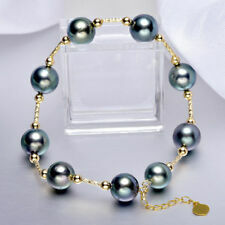 Pearl Bracelet. Bracelet Ring Sets. Jade Bracelet. Mala Bracelet. Agate Bracelet.